Floki: This is your fault Ragnar. Torstein died fighting for a hill he did not want to own. Something which meant nothing to him. He has died a pointless death. How many more of us must die for your Christians? Or have you, in your heart, already renounced our gods and turned to the Christ god. Is that what your friend Athelstan has persuaded you to do? But look, here we are under a English sky burying our dead. Look at those we have sacrificed for Jesus Christ. 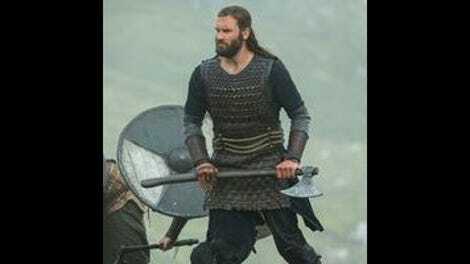 Ragnar: We are all fated to die on a certain day, yes? But it is our own choice to do what we please until that day comes. I did not force Torstein or any of you to come, for that matter. You all chose to be here. My heart is as heavy for Torstein as anyone’s, but I am sure I’ll bump into him again soon. But in the meantime, Floki, shut your face. Both Ecbert and Ragnar have belief, but, for Ragnar, belief is a pragmatic thing, an advantage that’s served him well thus far, and one whose efficacy continues, especially when reflected on Ecbert’s face when confronted with Lagertha’s practice of it at episode’s end. Ecbert: She’s a pagan god, like your gods Lagertha. Lagertha: She’s not like my gods. My gods are as real as you and me. They love they, breathe, they rush around the skies. It’s only when Ecbert returns to Lagertha’s settlement to patronizingly attend her announced sacrifice to ensure the crops the settlers have just planted (with the help of the iron plow he bestowed upon her), that Ecbert’s assurance is shaken. In the haunting, brutal ceremony, a cow is slaughtered, and Lagertha, standing regally in a white robe, anoints her face in red before two bowls brimming with blood are poured over her shoulders. Throughout, the regal, inscrutable smile on her face, while never directed at Ecbert specifically, reads like a riposte to his presumption. When one of his nobles repeats that the Vikings are savages who need to be converted or driven out, Ecbert doesn’t look as self-assured. Meanwhile, Lagertha, sowing the blood over the fields recently tilled by Ecbert’s gift, strides confidently ahead, her eyes and her smile unreadable. 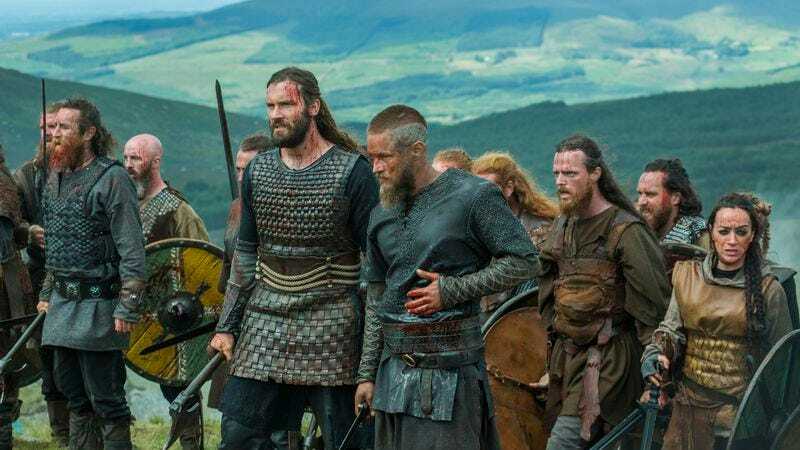 As striking as that scene is, “Warrior’s Fate” equals it with the season’s first great battle sequence when Ragnar’s band finally take care of Kwenthrith’s brother Burgred (an enduringly whimpery Aaron Monaghan). Always a strength of the show in the past, this season has seen its fight scenes disappoint, the crisp, intelligent action storytelling grown prosaic and clichéd. Here, however, the fight scenes find the old balance, the combined efforts of director Jeff Woolnough, editor Aaron Marshall, and music director Trevor Morris telling multiple characters’ individual stories through performance and action, and springing a series of satisfying surprises. Beginning with the final sacrifice of Jefferson Hall’s Torstein (who survived last week’s amputation, but not in good shape), drawing out the entrenched English, to the initial charge, where Ragnar and Gaia Weiss’ Porunn are both wounded, to the double shock of Ragnar cresting a hill and seeing a seemingly insurmountable second English force—only for Prince Aethelwulf’s archers to appear on the surrounding ridges and rain down arrows on Burgred’s doomed soldiers—it’s as assured a piece of sustained action as the show has ever done. In the initial battle, Morris’ music remains subtle, incorporating a syncopated chanting that underscores both the savagery and the alienness of the scene. There’s sparse but effective use of slow motion, spotlighting characters at moments of distress, or realization. And—one of Vikings’ unique traits—the kinetic storytelling is blessedly direct through all of that, the topography and the journey of each character told with clarity and energy. I do not think she will die. She wants to live. She has a lot to live for. But if she hears you weep and lament she will chose to die. Be strong, be a man, coax her back from Valhalla—but make it worth her while, for she is already at the gates. Meanwhile, back in Kattegat, the arrival of the stranger last week—there an alarming promise of a more supernatural turn for the show—comes back down to earth, thankfully. Despite his simultaneous dream appearance to Aslaug, Helga, and Siggy, the stranger (Kevin Durand, here named as Harbard), while remaining enigmatic, appears more like a flesh-and-blood character, although a vaguely sinister one. He describes himself as a storyteller and regales the women with boastful tales of carousing with giants. Given room to speak, Durand plays more like a character than the spectral harbinger he was introduced as, especial when he proves himself the only person capable of silencing the incessant crying of the unfortunate baby Ivar by, he says, “taking away his pain.” That two of the village’s children soon turn up drowned, far out to sea in a fisherman’s net, introduces, again, a more human creepiness to Harbard, and Siggy’s visit to the Seer walks back the prophecy talk further, as the soothsayer claims he has seen nothing of the stranger’s coming—or his intentions. It can’t undo the unpromising way this storyline was introduced, but it’s a more interesting direction for it to take. “Warrior’s Fate,” similarly, is a promising sign for Vikings’ third season, reintroducing some of the complexity and flair for visual storytelling that marked the show at its best. Unlike the programmatic nature of the first two episode’s, it’s entertaining not knowing where it’s headed once again. Poor Athelstan—when Ecbert and Lagertha start unashamedly coupling in the bath, he’s simply ignored, left to look awkward and towel off. Speaking of, while George Blagden’s sly watchfulness as Athelstan remains a fascinating portrait, his ongoing storyline being pursued by Jennie Jacques’ Princess Judith isn’t promising. Although his position as spiritual representative of both worlds marks him out for bigger things this season. Lagertha’s gleam when hearing tales of Paris does not bode well for the city. While Lagertha seems to have learned a few phrases in Ecbert’s Old English, the show continues to play loose with translation rules. This is not about you, Floki. This is about our children. And their children. It is about our people’s future. I do not want there to be endless conflict with the Christians. And the way he deals with his grief by headbutting the groveling Burgred with a smiling, “I forgive you,” is some prime Ragnar. The way that baby Ivar pointed, terrified, at Harbard was…unsettling. Siggy is the one of the three Kattegat women who’s having none of Harbard.